Nazaré's Cap'n Mike had warned us: the Guadiana is a dangerous place; people enter and are never heard of again, or come out being an alcoholic. Well, we had managed to get out once before and we ended up not drinking more than we used to – though not any less either. But it's true: life on the river is hard to get away from. So what do you do when you're sailing on a border river? Fly both courtesy flags! Next question: which flag should be highest? Okay, today we choose for ¡España Arriba! We spent a day at anchor opposite Vila Real, relaxing and baking bread and making yoghurt and so didn't bother dinghying ashore. The day after we moved upriver to see if much had changed in the last two and a half years. The most obvious thing was a new large windmill park up on the hills north of Ayamonte on the Spanish side. The houses on the river front on both sides looked quite well maintained and not affected by the financial crisis, which might also be because they are now owned by foreigners. The first village with a pontoon is Foz de Odeleite, some 10 miles upriver, where there are several boats on moorings and most of them we recognized from before and most of them with no one on board. After Foz the river gets really nice: less buildings, and the hills are higher and nearer the river. We dropped anchor between Guerreiros and Laranjeiros, the next two villages on the Portuguese water front with a pontoon, and had a lovely quiet night, enjoying the many stars that were visible in this dark sparsely inhabited area. At Laranjeiros there are also some ten uninhabited boats on moorings. You start to wonder where the owners are: bought a property on the river, but still want to hang on to their boat (no for sale signs anywhere) or back in their own country in a house, earning money to pay for boat and house? A shame really that they are not able to enjoy life afloat in a nice climate. It does make it a bit of a ghost town river though. And the villages are like ghost towns as well. Many nicely done-up second homes, but no one there, and of the local population all but the the very old have left. We had wondered if we would find the cost of life changed with the financial crisis in Portugal. VAT had gone up from 20 to 23% but when we went for a coffee in the little café we were astounded to pay only € 1 …. for 2 coffees! After some more lazy days at anchor we moved a bit further to the metropoles of Alcoutim and Sanlúcar, opposite each other, or that's what they seemed after a few days at the very quiet other villages. It was great to meet up with various people we knew from before. 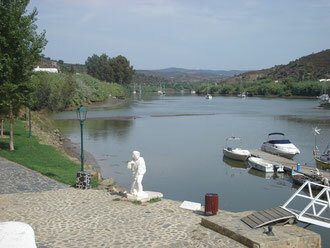 Yes, the Guadiana is a place where people get stuck or at least return back to again. Like us. It was also wonderful to get some walking done again in the hills around. On the Spanish side the old Roman road along the river had been prettied with wooden guard railings in some places, benches on the lookout points and even some wooden bridges which had been flown in by helicopter we heard. Crisis? What crisis? The temperatures were slowly changing from just hot to really variable with chilly 15º mornings, hot 35º afternoons and lovely lukewarm evenings. This meant a lot of adding and taking off layers of clothing. 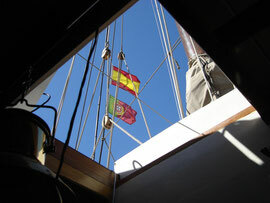 We started to do various boat jobs and time just flew. Except for a few days at the Alcoutim pontoon we stayed at anchor and so could finally compensate the previous expensive marina months. But we were running out of peanut butter, so after about a month on the river we moved down to Vila Real to do a lot of shopping and some sorting out of boat yards and other boaty things. This picture shows the bar just to the north of the north-pontoon at Alcoutim. It only becomes visible at low LW spring. And so is tricky at other times... which we know, having got stuck on it one time.